Every time you Google something or click on an ad in a YouTube video, Google gets paid. They are estimated to make well over $100 million a day, and I honestly think that's low-balling it. Of course, making more money than most countries do doesn't quite cut it for big bad Google. They recently announced integrating your personal Google+ profile pictures into their online ads, à la Facebook's Social Ads. That means that your face could be next to an ad for adult diapers without you ever knowing. If you've used Google in the past few days, you've probably seen the small disclaimer they've been running up top to inform people of their latest policy and terms of service changes. If not, you can check them out here. The most glaring change is the use of your profile picture in advertisements. Google proclaims that the changes are being made to better recommend services and products to those people in your social circles. It should be noted that your profiles and likes (+1s) will only be shown to people that you're currently connected to and have chosen to share certain information with, just like Facebook claims to do with their Social Ads. Also, your profile will only appear next to ads or products that you personally have followed, commented on, or shared yourself. NOTE: If you are under 18, you may see shared endorsements from others, but your own name and profile will not be paired with shared endorsements in ads and certain other contexts. Even still, people do not like the fact that their face will be used to sell something without any form of compensation. Some people have taken to protesting. Using Google Chairman and former CEO Eric Schmidt's face in place of their own profile photo. 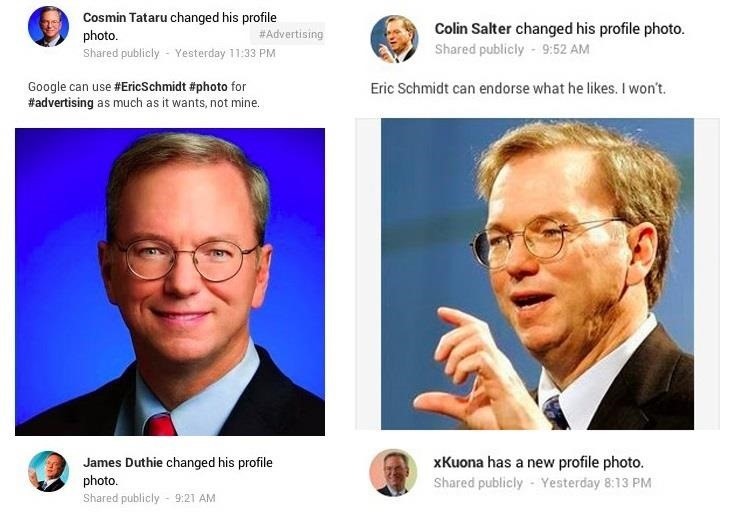 If you want to stick it to the man, that's the way to go, at least until they build an algorithm that deletes every likeness of Schmidt on Google+ except for on his own profile. If protesting is not for you, you can opt out of Google's new ad program. Thankfully, it's pretty darn simple. Follow this link to visit the Shared Endorsements in Ads setting, and scroll to the bottom where you will see this message and a small check box underneath. Alternatively, you can get here by going to your Google+ Settings and clicking on Edit next to Share Endorsements. 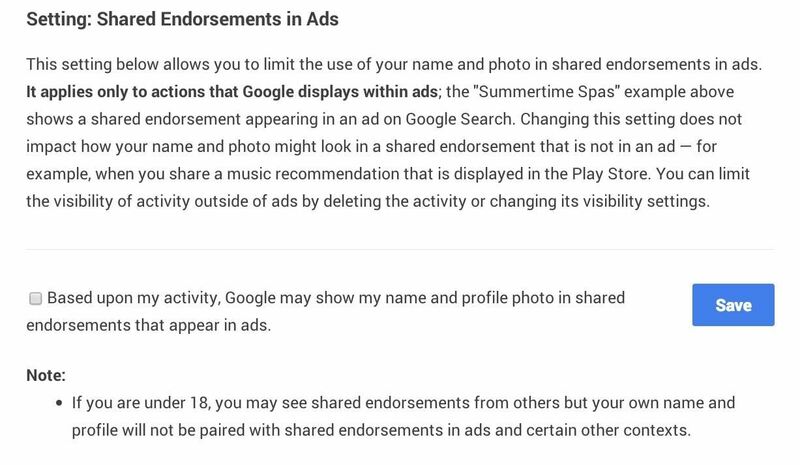 All you need to do is un-check that box that says, "Based upon my activity, Google may show my name and profile photo in shared endorsements that appear in ads." Google will try to dissuade you. Ignore them and click Continue. Your settings will then save, and it should say "off" next to Shared Endorsements in your Google+ Settings now. Google knows how to make things easy at least, something Facebook still needs to work on.